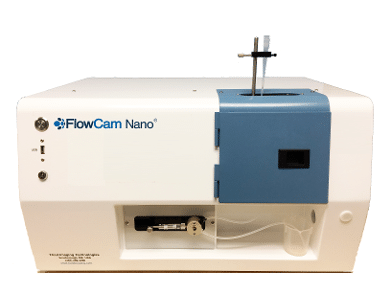 FlowCam Nano® provides counts, sizes and images of nano- and microparticles. This patented oil immersion, flow imaging technology complements our industry-leading imaging analysis system to provide you with the most comprehensive particle analysis research and development tool for parenteral drug analysis. The new FlowCam Nano® can generate highly resolved image analysis of both nano and microparticles, allowing assessment of morphology for micron-sized and submicron particles. In addition, particle sizes and counts are obtained for particles as small as 0.3 microns. This capability is extremely useful.